Welcome to Round 3 of the Halifax Ramen Quest! Make sure to see Round 1 and Round 2 in which Truly Tasty and Studio East emerge successful against their opponents, B-Well Sushi and Water & Bone. 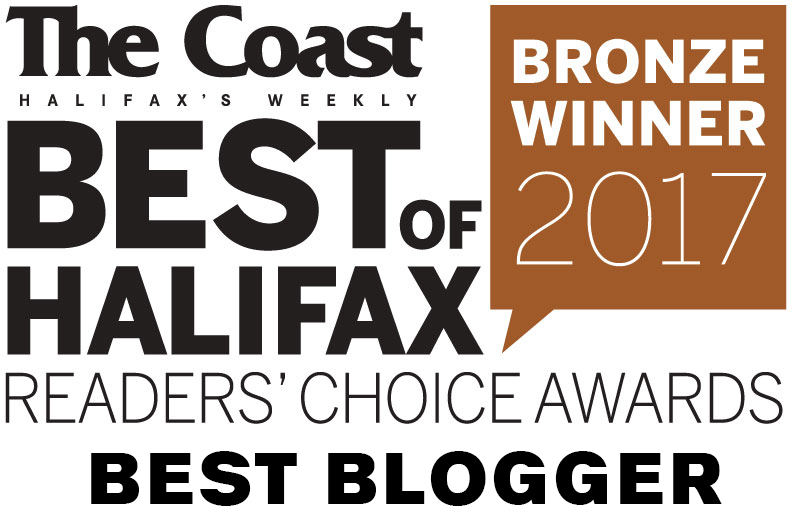 Round 3 takes us to Clayton Park to evaluate Tako Sushi & Ramen and Sushi Nami Royale. Both of these restaurants have strong followings for their sushi, but how about their ramen? 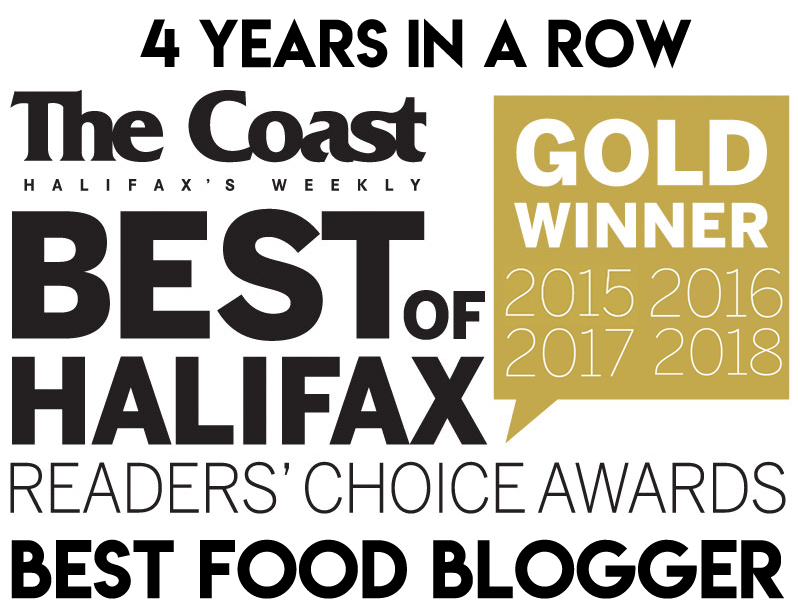 Questers: Halifax ReTales, Helen Wong, Denton Froese, LuShark, Eat This Town. Denton and Helen split the Tonkotsu Ramen ($12.95). 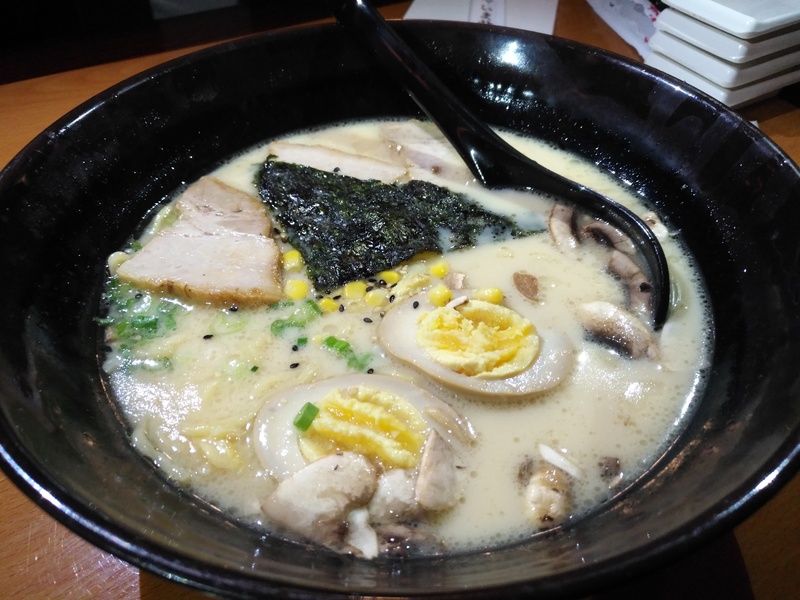 You may remember that they didn’t care for the tonkotsu at our last venue, so we all wanted to know how they would rate this one! They quite simply loved this soup. “A smooth, subtle confluence of tastes,” wrote Denton. 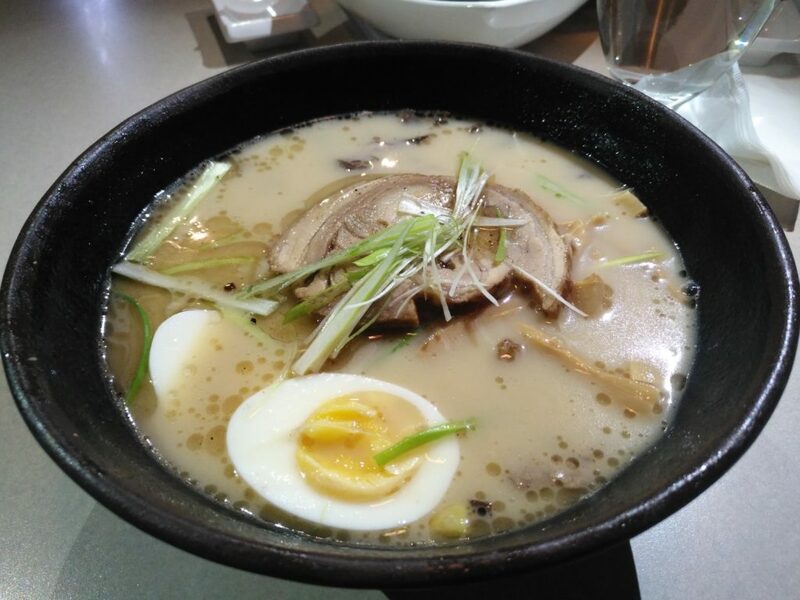 “Excellent broth, wonderful flavour and texture in the noodles”. “The broth was full of rich flavour of pork,” wrote Helen, who also noted that the pork was equally fatty and meaty – a desirable balance. “The noodles had a great bite to them and satisfied my hunger”. They both gave top scores for broth and noodles. ReTales, LuShark and I split the Hokkaido Ramen ($13.95) which is a spicy, hearty soup with char sui pork, mushrooms, green onion, corn, nori and a marinated egg. ReTales also liked the broth, but felt that the broth-to-solid ratio leaned towards the brothy side. I agreed – there wasn’t enough pork, but it was tender with a touch of fat. The noodles had a great chew/bounce for being standard noodles. The corn and mushrooms added a nice touch and we all liked the eggs. This ramen was simple and satisfying. LuShark described it as “safe”. The Clayton Park location of Sushi Nami only has one ramen on the menu. 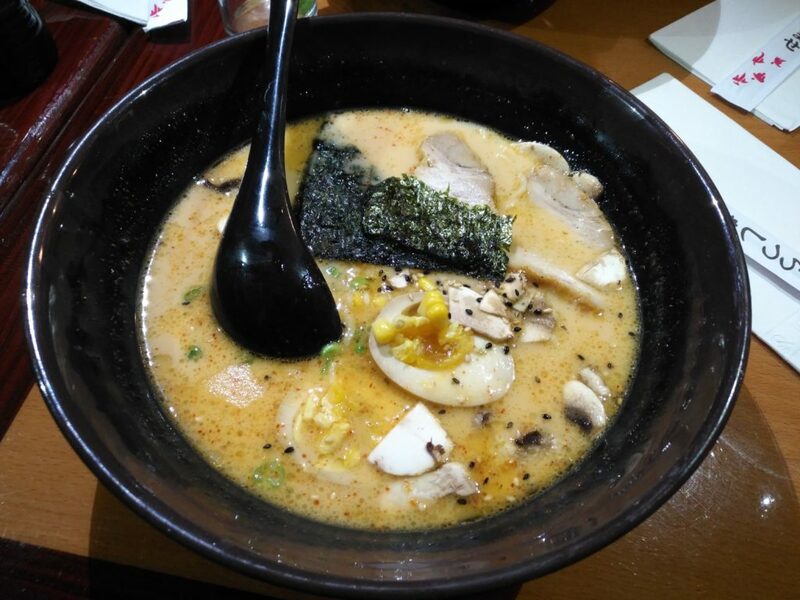 It is a Tonkotsu Ramen ($12.95) with variations. You get your choice of chasu or tenderous ribs, and there is the option to make it spicy. 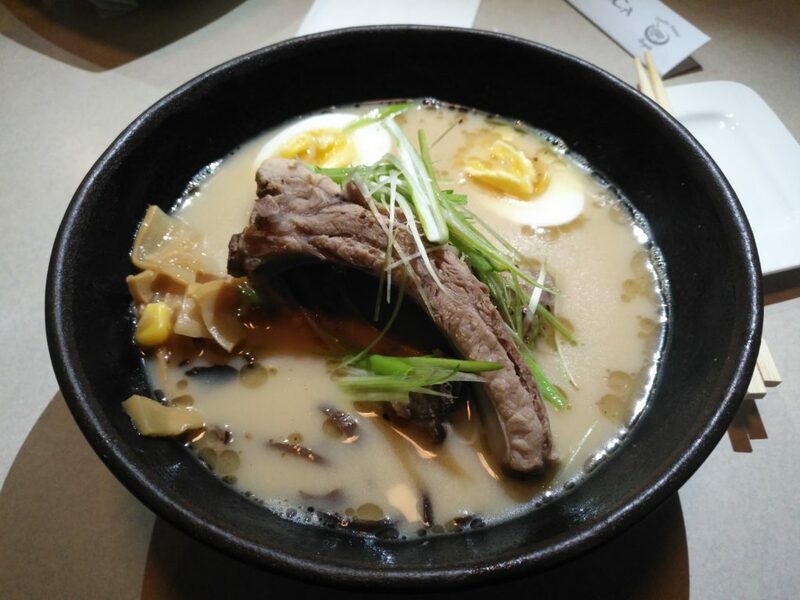 The downtown location additionally offers a beefy shoyu ramen and a chicken miso ramen. With limited options, Helen and Denton went for the tenderous ribs while ReTales and I opted for the chasu pork. We all decided to have the straight version. It was complimented with corn, fungus, scallions, and bamboo shoots. The broth was salty with a silky oiliness, but not the creaminess that is often associated with tonkotsu broth. Both Helen and Denton talked of a pungency, amplified by the fermented bamboo shoots. LuShark and ReTales were reminded of packaged ramen – the good stuff, with the oil packets. By all accounts, the ribs were overcooked and so were the noodles. The chasu pork seemed to us as if it was sliced from a loaf and just dropped into the bowl alongside the shrug of a boiled egg. Denton described this ramen as “serviceable”, which somewhat echoes LuShark’s one word review: “McRamen”. Winner –> Tako Sushi & Ramen! Tako’s ramen scored highest in every category and was the best overall experience. Most importantly, the broth and noodles were superior; the rich, warming broths and bouncy noodles won our hearts. Unrelated but important: Tako also makes better sushi.